Would you like to try a homemade pita bread? This pita bread recipe is one of many pita recipes. They all have something in common - they are fun to make, and suitable for every occasion. Dissolve the yeast in ½ cup warm water together with 1 tbsp flour and 1 teaspoon sugar, then leave for 10 minutes. Put the flour and salt in a large bowl and add the yeast mixture. Mix together with the oil and water and make a stiff dough. Leave the dough in a warm place for one hour. Knead the dough until smooth then place it in a lightly oiled bowl. Leave for another hour to rest. Divide the dough into pieces and flatten each piece with floured hands. Heat a large, non-stick frying pan on a medium high heat. When hot, lay one piece in the pan and cook for 3 minutes, turning frequently. Serve hot, or make sandwiches when the pitas are cooled. Pita Bread is a bakery food item that originated in Istanbul. In Turkey, it is popular by the name of ‘pide’ and is made for making various tasty pizzas like dishes with use of cheese, potatoes, onion, etc. It is usually manufactured in variety of sizes. This type of bread can be easily manufactured without making any hard efforts by bakers. 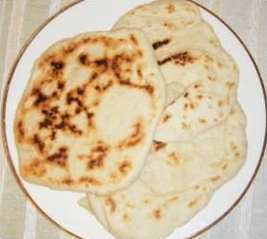 In fact, bakers can prepare pita bread without using ovens or special utensils quite comfortably. Its popularity is seen more in the western parts of the world in the form of sandwiches and other delicious dishes. In fact, in western countries, bakers never use pita to scoop food but they make sandwiches by filling pita pocket by using useful ingredients. Pita word is of Greek origin which means ‘solid’ or ‘clotted.’ The meaning of this word in Arabic dictionary is different and pita bread here is known as khubz arabi. Quality and glory of pita bread was well described in the Arab cooker book named ‘Kitab al-Tabikh’ by Sayyar al-Warraq in 10th century. In this book, the author very well described delicious six recipes for khubz or pita bread which can be easily made in tandoor oven. Pita bread is extensively useful for culinary and it is found to be extremely useful in scooping sauces or dips. It is used with kebabs and sandwiches. Most dishes of pita bread are baked at somehow high temperature and due to such temperature; the flattened rounds of prepared dough can puff up very easily. On the removal of pita bread from oven, the layers of baked dough gets separated which is very useful for making variety of special dishes of pita bread. The best part is that it can be frozen and kept up-to six months for consumption later. Bacon, sausages, tomatoes, pineapples, chicken, onions and mushrooms can go very well as toppings for pitas.